Often when a conversation on debt in Africa emerges, the focus is on public debt. And this is warranted as African governments are accumulating a significant amount of debt. Since 2007, countries such as Zambia, Ethiopia, Rwanda, Kenya, Ghana, Senegal and Cote d’Ivoire have issued sovereign bonds worth over USD 25.8 billion. In terms of local debt, African local debt stock rose from USD 150 billion to about USD 400 billion between 2004-14. In Kenya, government has already overshot its fiscal year debt target having borrowed KES 147.1 billion against a target of KES 106.0 billion. Debt accumulation is unlikely to slow in the near future due to several factors: firstly, Africa needs to spend USD 600 billion-1.2 trillion to implement the sustainable development goals according to the UN Conference on Trade and Development (UNCTAD); there is impetus to spend and thus borrow. Secondly, Africa continues to be an attractive market for debt. According to Bloomberg, yields on Kenya’s 5-year and 10-year Eurobonds declined by 2.8% and 1.9%, respectively from the mid-January 2016 peak, perhaps indicating that Kenya continues to be attractive investment destination able to attract even more debt. There are serious, multi-layered concerns with the accrual of debt by African countries. The most obvious is sub-par domestic revenue generation which compromises the ability of African governments to service both domestic and foreign debt sustainability. Foreign debt has additional risks: falling commodity prices have compromised the ability of African governments to raise forex; the strengthening US dollars makes servicing foreign debt more expensive and as the global economy recovers, there are forecasts for higher global interest rates. An additional point of concern as The Economist points out is that African governments are getting more money from private creditors. Official lenders are more willing to reschedule or reconfigure payment terms if governments get into trouble; private lenders are less willing to do so. An additional overall concern is financial mismanagement and its implications on debt. Corruption spikes the costs of public projects to accommodate expectations of kick-backs by public officials thereby increasing borrowing demands beyond what projects actually warrant. Secondly, embezzlement of public funds means money does not reach intended projects, reducing the economically regenerative power of said projects. However there is another, less publicised debt problem emerging on the continent: private debt.Figures on private debt in Africa (Kenya included) are hard to come by but perhaps a look at mobile loan figures may be indicative to the growth of private debt. According to the Business Daily, KCB-MPESA disbursed KES 10.3 billion to customers since inception to September 2016 and Equitel has issued KES 20.8 billion in loans since June 2016. Debt is a feature of life to Kenyans and Africans be it in the form of loans from mobile platforms, commercial banks, MFIs, SACCOs or merry-go-rounds. And it not only the rich and middle income individuals getting into debt; even low income individuals are accruing debt. Conversations with informal business people indicate that the presence of credit vendors has encouraged a pattern of a single individual receiving essentially unsecured loans from numerous credit vendors at the same time. This individual then faces massive financial pressure to repay numerous debts and is often unable to do so sustainably. Clearly, there is a need to further unpack the scale of private credit amassed in Kenya and continent to better understand the continent’s actual debt stock. Further, while African governments ought to be more prudent in debt subscription, perhaps the same ought to be promoted among private borrowers, many of whom do not necessarily have the financial literacy skills to fully appreciate the implications of debt and how to service it sustainably. This entry was posted in Africa, Development economics, Economics, International Finance, Kenya, Political Economy and tagged borrowing, Credit, debt. Social capital can be defined as the networks of relationships among people who live and work in a particular society, enabling that society to function effectively. The positive aspects of social capital are selflessness, generosity and compassion. In countries that are not social market economies with a robust government funded security net, social capital is a crucial means through which the vulnerable are supported to have a better quality of life. We see this in Africa everyday: supporting friends and family with school fees; fundraising for the medical care of others or providing monthly stipends for unemployed loved ones. Social capital is a crucial part of the fabric of African communities where many still feel a sense of responsibility for others. Indeed, there is a theoretical possibility that the introduction of social market economies in Africa may lead to an erosion of this social capital. However, there is a dark side to social capital; a side that enables cronyism, tribalism and corruption. A side where oneself and a select group of associates or beneficiaries have priority over collective well-being. The self, not the other is the core of negative social capitalism; a core where the self and a limited circle are the intended beneficiaries of generosity, often at the cost of the welfare of others. Kenya’s best known expressions of negative social capitalism are tribalism and corruption. In the case of tribalism, the tribe to which the self belongs is deemed as rightfully superior to the tribe of the other. Kenyans tend to (silently) condone tribalism as long the tribe of the self is benefitting from unearned favours and undue favouritism. Uproar only ensues when the tribe of the other is accruing the benefits. This has resulted in a lack of commitment to end tribalism in in the country. Kenyans are happy to benefit from this beast when it’s their turn to eat and only refer to the need to adhere to principles of justice and fairness when it is not their tribe benefitting from cronyism. Kenyans will bemoan tribalism from the tribes of the other but fervently defend individuals who are conduits of tribalism in the tribe of the self. As a result this version of negative social capital expands as the circle of beneficiaries contracts and does not extend beyond tribe. A worrying, emerging reality in the context of devolution, is that negative social capital is being expressed as the devolution of tribalism. Speaking to county officials has made it clear that at county level, the circle of beneficiaries of Kenyans is narrowing from tribe to clan. Kenyans are keeping an eye on how positions at county level are divided among clans. Discontent arises if one clan is seen to be benefitting from county appointments more than others. This is a worrying form of self-obsession because it is rooted in a sentiment of exclusion not inclusion. 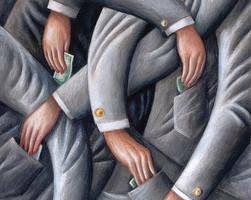 Corruption is an interesting phenomenon because it is the conduit through which negative social capital is expressed. Corruption is the means through which cronyism and tribalism are brought to life. What is fascinating is that those engaging in corruption feel justified in engaging in it because they have beneficiaries who rely on them, who are better off due to their pilfering. Their children go to better schools, their parents live in better houses and their spouses drive better cars. Thus, in the warped world of negative social capital, the individual engaging in corruption feels justified in their embezzlement. And the irony is that what should be the positive aspects of social capital, caring for others outside the self, emboldens corruption and thus what ought to be positive is turned into an ogre that pillages the other to benefit the self. Tribalism and corruption cripple the ability of the country to work towards a common goal rooted in an incentive to work hard. Tribalism and corruption allow individuals to reap where they did not sow. How then can a country truly develop if honesty, diligence and hard work are not rewarded? This entry was posted in Africa, Development economics, Economics, Kenya, Political Economy, Politics and tagged corruption, Social capital, tribalism. Speaking to businesses over the past few weeks has made it clear that the effects of the interest rate cap are already being felt. And while banks may be experiencing a surge in applications for loans, they seem to be approving fewer than was the case before the rate cap. As had been my prediction from the beginning, it is the small businesses that are being hit the hardest by the interest rate cap already. Firstly, banks seem to be raising requirements for loans; micro and small businesses have shared with me that they are being told they either need a title deed or log book and that their application is not even considered without at least one of these documents. Yet it is these very businesses that need the credit the most, that do not have the requisite documents. Larger SMEs are getting access to credit but not to the scale prior to the interest rate cap. It seems they too have to make their application risk free to get access credit and even then, not to the scale desired. Very large businesses seem essentially unaffected by the cap because they were getting loans at about the current rate already and often have more options for finance sourcing. Another negative effect of the interest rate cap is that concessionary lending from banks seems to have become an impossibility. My conversations reveal that previously, projects that stimulated positive social impact some banks espouse such as clean energy would receive competitive rates to encourage the development of that field; such projects are no longer enjoying such flexible lending due to the rate cap. Interest rate variability is a risk management tool for banks and since they do not have access to this tool anymore, it seems that interest rates at below market rate are simply not being awarded anymore, even if such projects previously enjoyed concessionary rates. As a result, some impact focussed businesses are losing out on a key means through which pro-development projects used to be incentivised. Additionally, banks are mitigating loss of income from rate spreads due to the interest rate cap but adding fees and charges to services that were previously free. Frankly, it was utopian for Kenyans to assume that interest rate capping would unleash lending and attendant business and economic growth. Kenyans are now seeing that liquidity seems to have tightened rather than loosened, as some analysts myself included, had warned. Further, the business environment in Kenya is the biggest impediment to business growth in the country, not just access to finance. The introduction of new fees for the movement of goods and branded vehicles by county governments and the high cost of transport and electricity are some of the biggest impediments to business growth in this country and unleashing financing will not solve these problems. Devolution has made it clear that corruption, not access to finance which the interest rate cap sought to improve, is a key constraint to business and economic growth in the country. Devolution is positive in that it has brought governance closer to the people, but it has also created numerous channels through which unscrupulous public servants can seek rent from businesses. The problem seems most dire at county level where there is limited automation and inadequate scrutiny of county revenue generation and spending. County officials seem to have the greatest leeway to harass businesses for imaginary infractions with no need to account for their behaviour. Unleashing financing won’t solve this problem. It is not all bad news however; Savings and Credit Cooperative Societies (SACCOs) have become a more attractive financing option particularly given that some SACCOs already provide credit to members well below current bank rates. This may lead to an expansion of this sector thereby broadening financing options for Kenyans. Further, increased difficulty in accessing loans will make it harder for Kenyans to take on credit for consumptive rather than investment purposes. Applications will have to be thought through more rigorously than perhaps previously was the case; this is good news. This entry was posted in Africa, Capital Markets, Development economics, Economics, frontier markets, Kenya, Political Economy, Politics and tagged interest rate cap, liquidity, SACCOs, SMEs.